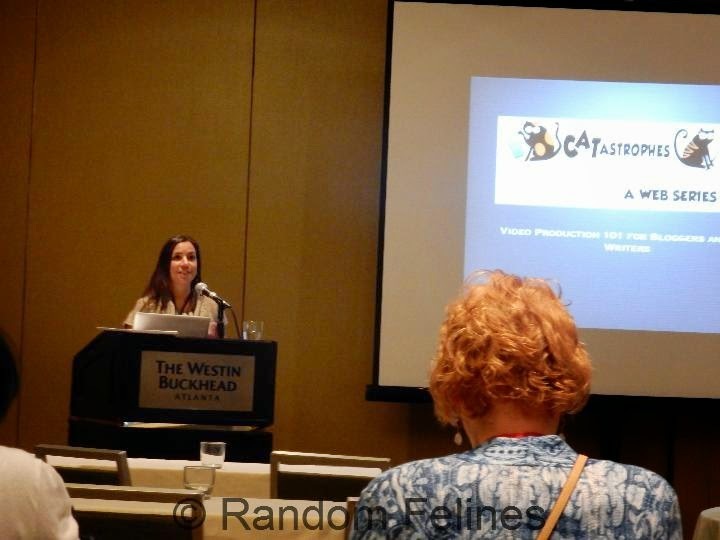 As we reported last week, mom traveled to Atlanta to BarkWorld/MeowWorld. She left Wednesday and took Sangria and Stoli with her. Sangria protested the first 90 minutes of the trip before settling in for the ride. They stopped overnight at Grandma and Grandpa's house. Their back hallway has a pocket door, so the kittens had run of that space. The dog stood guard most of the night...they weren't introduced but he KNEW they were back there. 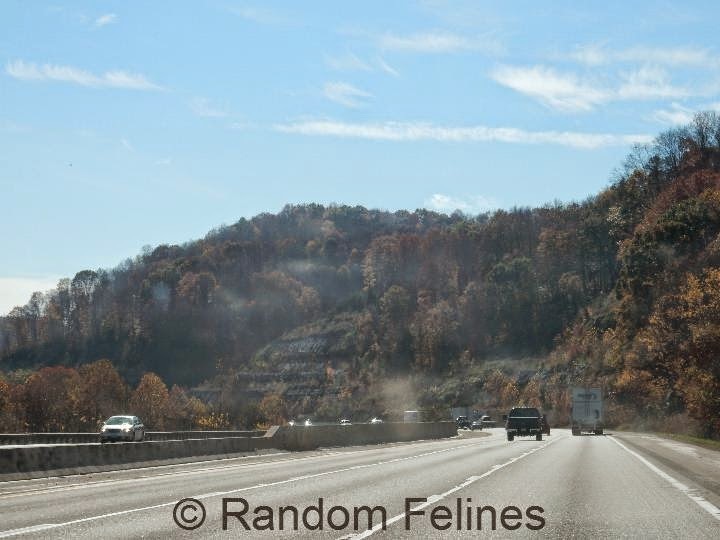 Sangria insisted on singing the song of her people about half of the trip the next morning to Atlanta. Fortunately she settled down after that. Stoli was good both times - just minor meeps to accompany his sister. 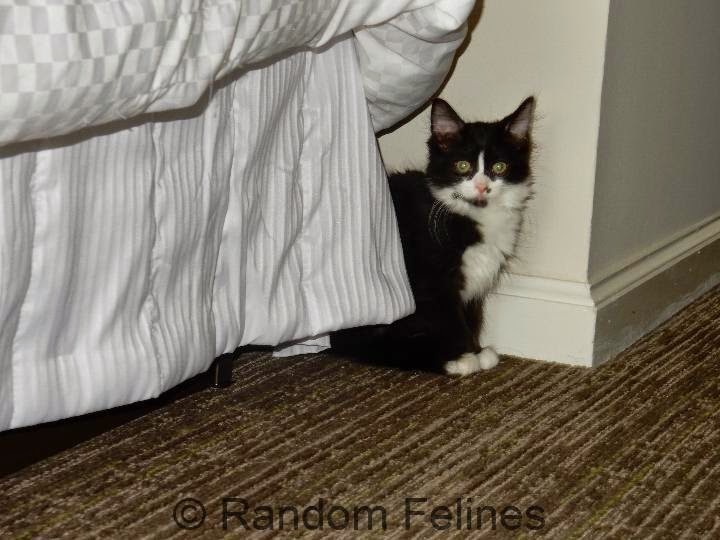 Mom was rooming with Miss Julie from Sometimes, Cats Herd You and she wanted to love on the kittens.... who took one look around the room and hid under the bed. MOL However, mom took Sangria down for registration and Stoli down for the intro party. He was pretty freaked out, but then Miss Deb from Chronicles of Zee and Zoey got her hands on him and put the mojo on him....he actually fell asleep on her lap! Mom says she has to be honest....the conference itself was kind of a bust. There was one seminar she went to and enjoyed (done by Miss Alana of Cat in the Fridge) about videos. Mostly mom said it was a great weekend to hang out with other cat lady friends she has met online (and some in person before). There were so many, the list would be huge, but mom says it was great to see everyone. The kittens were well behaved. Sangria got out more than Stoli since being out made him very nervous. But in the room, they relaxed after the first night and were bouncing on both beds. Even when people came up to the room to see them, they would hide at first and then come out and play and enjoy being loved on by everyone. They even got to meet the famous Glogirly and Waffles!!! 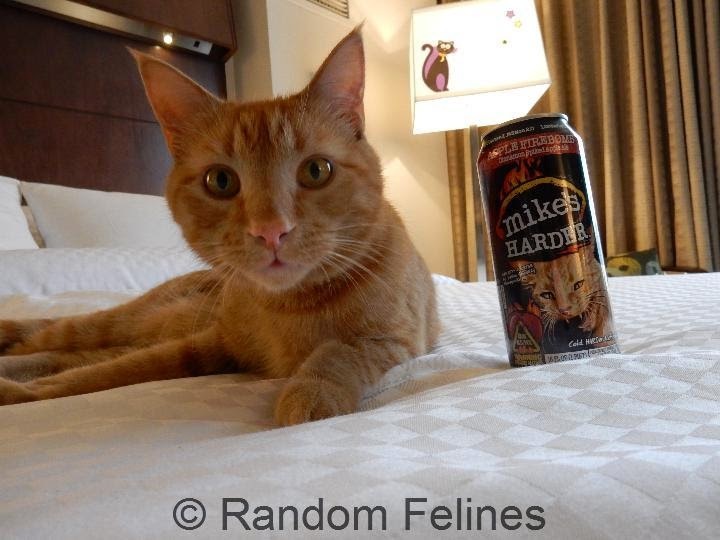 In case you have been living under a rock, Waffles' face is now on a can of Mike's Harder Apple Firebomb. How cool is that???? There was a party (the kittens weren't invited) but they got to meet Waffles the following afternoon. You can see more pictures at the Glogirly site and A Tonk's Tail - mom was supervising the kittens and didn't get many pictures (Miss Connie took the one below for mom using mom's camera). Waffles wasn't too freaked out, but made it clear those kittens weren't allowed in his room. MOL Stoli didn't get too close but Sangria did and was pretty much unimpressed...of course she hears the name calling here, so been there, done that. Oh - and there was this thing called a cupcake ATM at the mall nearby..... we understand it got used several times though the only evidence we have of that is this picture of Miss Julie letting Sangria try some frosting. 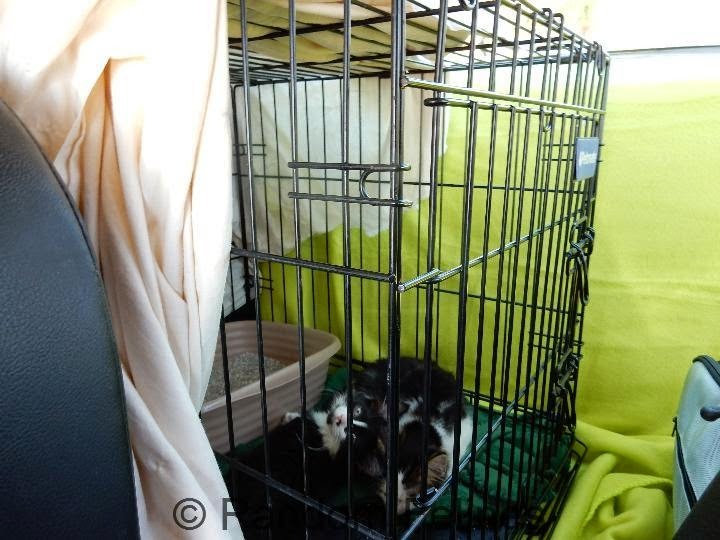 Awwww, your kittens are so precious, and they are so lucky they got to go on the trip with you. M would love to go to BarrkWorld or Blogpaws. She so wants to meet all the humans of my pals. Great group of hummans, M says. 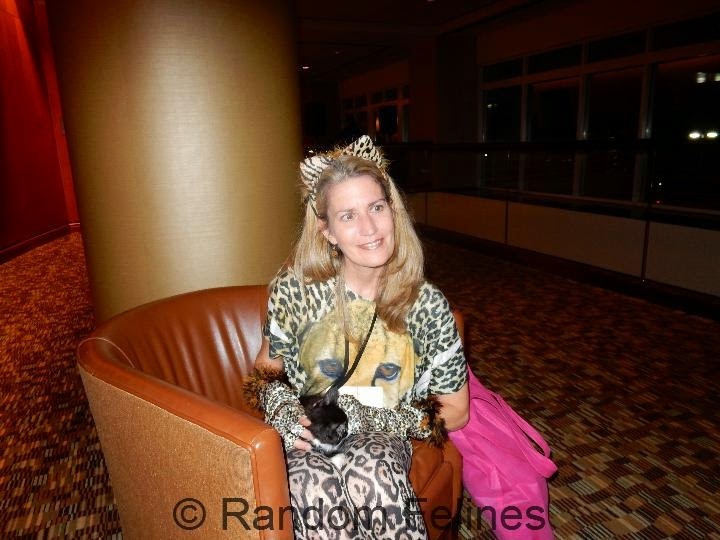 It's too bad the conference wasn't what your mum was hoping for, but at least she had fun with the people and cats she met there. And now everything can get back to normal. That was probably very good for the kittens to see so much stuff.They sure are cute. Glad you had a good time with all the peeps. It was sooo great seeing you in pawson!!!!!!!!!!!!!!!!!!! I'm sure I thanked you, but thank you again for bringing the kittens..
My human was so disappointed that Alana's session was at the same time as hers! She really wanted to attend too. But she enjoyed seeing you and the kittens, even if Stoli didn't like her much (unlike Deb, she is NOT a kitten whisperer). It would have been worth it for the cup cake, mum says! Just kidding! 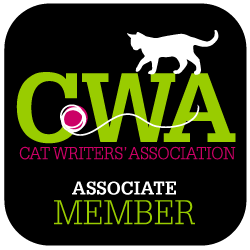 It sounds like a blast meeting all the cat bloggers, even if the seminars weren't great! What a fun time! Thanks for sharing the wrap-up, and the cupcake photo! The head peep has been telling people about that for days. She hereby apologizes to Sangria's future family, who will never understand why she will not stay out of their cupcakes. 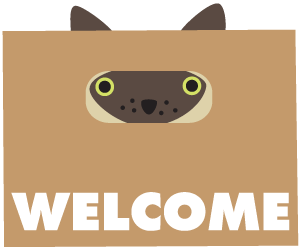 And thanks to you and the kittens for being such fun roommates. The head peep loved sharing adventures around BarkWorld with all three of you! Sounds like everyone had a great time meeting up together. There was LOTS sod squeeing going on!!! I'm so happy you brought Stoli and Sangria! Kittens always make everything better. SO fun to spend some time with YOU too! ...but you had to bring up that Cupcake ATM again, didn't you? I've been dreaming about that ATM. haha! Thanks so much for the cool photos and shout out! It was wonderful seeing you again and I really enjoyed having Stoli nap on my lap - what a treat! Purrs from Deb and the Zee and Zoey Gang!